Congratulations Emily on completing your third half marathon this year – and your third EVER half marathon! Emily has only been running for 13 months and already she’s completed three (crikey!) halves (Paris, Leeds and Windsor). With a 22 degree heat and a very tough undulating course it wasn’t all plain sailing for Emily who told us she would ‘NEVER do Windsor again’! Despite that she still managed to beat BBC Radio 2 presenter Chris Evans by a good 25 minutes – so not all bad Emily? Read more about Emily’s race in her blog here. 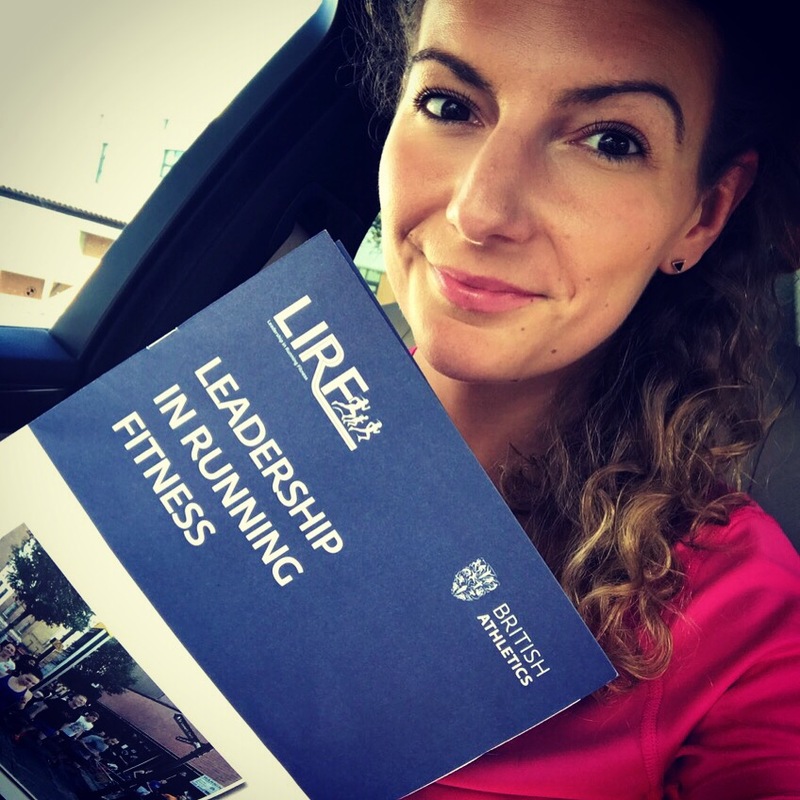 This week we’re wishing a huge congratulations to our runner Emily who yesterday qualified as a Run Leader on the England Athletics Leadership for Running Fitness course! We’re looking forward to her sharing her joy and enthusiasm for running with us on the runs that she leads in the future. To read more about Emily’s training, visit her blog here. And you can find out how you can take the Leadership in Running Fitness course here. All our runners are brilliant, but one of them has been particularly amazing of late, Kate Lewis. Not only did she complete the London Marathon earlier this year with a fantastic time of 3 hours and 42 minutes, qualifying for London Marathon in the 2018 Good for Age category, but in the same week she won the Battersea Park 5k! Finishing the race with an outstanding time of 21 minutes (roughly – sorry Kate we only have your Strava to go off!) she came first in the women’s 5k and was third overall – only being beaten by two of the men. Hurrah! We are all so proud of you Kate – you are an inspiration to us all – and we look forward to following your journey as you prepare for the London Marathon 2018. Find out more about Kate by visiting her blog here. Brrrrrrrrrrrrinnnnnnngggggg! My alarm goes off at 6am every Tuesday. My initial thought is to roll over but no can do- The OLRC training session is about to start. I love our Saturday morning runs but in order to improve performance and times my training needs mixing up and what better way to do this than with the girls of Oxted ladies run club. Every Tuesday at 6.15am we will be meeting for a 40 minute session to carry out either a hill, sprint or strengthening session. This gives us variety, ideas for our own personal training and above all a no excuses time to shake up our training. Location varies so you need to be on our what’s app group to find out exact details but as always contact Emma and she will point you in the right direction. Today proved to me that setting up this running club was one of the best things I have ever done. Even on a cold dark Saturday morning 15 of us rocked up and walked /run together and managed to raise £50 for clockwork. We finished up at our new post coffee stop, Toast and had fab coffee, smoothies and breakfast. The amazing people at Toast have agreed to offer all membership card holders 10% off all food and drink which is incredibly generous and this is what the club is all about, being part of a community. We are very lucky to live in an area like Oxted where the sense of community is so strong. Our club walks, it runs but for me it offers friendship, support, fun and a sense of belonging. Our common love for exercise has brought us together and I for one am very proud to be part of such an awesome group of girls that are clearly becoming part of a much bigger community. We have decided to support a local charity every year. For 2017 we have decided to support an amazing local charity set up to raise awareness and money for young adults in the Surrey area. To kickstart our fundraising our amazing girls will be running a santa run on the 17th December, donning some Christmas attire and popping some pennies in the pot. Why don’t you come along and join in the fun! ?